This article was originally posted to ShipStation's The Daily Shopper blog. View original blog here. Holiday shopping season is approaching, so get your team ready — because shipping is coming. As an online merchant, you need to know the holiday shipping deadlines for carriers and services to get your packages delivered by Christmas weekend. Knowing these cut-off dates will help you set accurate shipping costs, offer available services, instill trust in your online customers, and help them shop on time! It’s the season of giving, so we’ve compiled the service ship-by dates for the top carriers in the contiguous United States. The information you need for USPS, FedEx, and UPS is nicely packaged up into a one-page infographic for you to use this holiday season. Download it, print it, share it, post it on your warehouse wall — whatever will help you #shiptheseason this busy holiday! 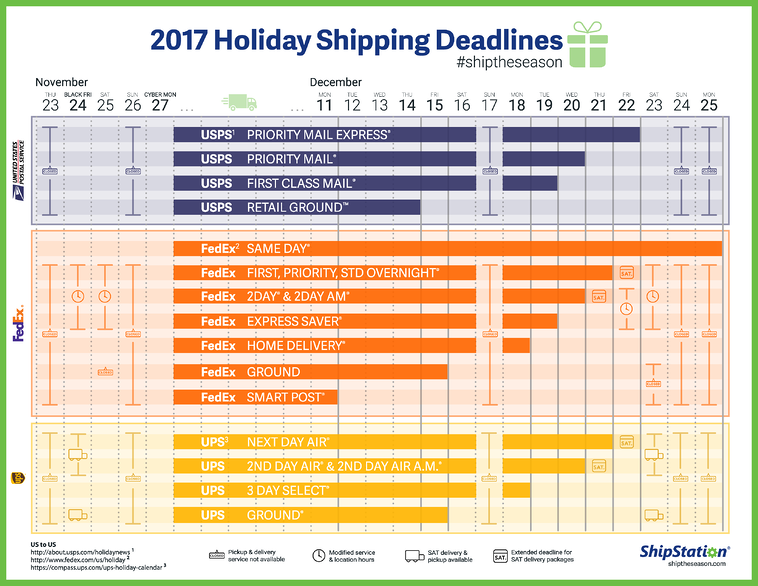 The Holiday Shipping Deadlines infographic is great for a quick glance to see when there are upcoming service cutoff dates, holiday and weekend closures, pickup and deliveries, as well as irregular hours. Depending on your location or situation, you might need more info to be prepared for the big rush! Below is some additional information to be aware of as you start preparing for the holiday shopping season. USPS: Learn more at the USPS 2017 Holiday Newsroom. FedEx: Learn more on FedEx Shipping Services for Christmas. UPS: Learn more on the UPS Holiday Schedule 2017. Do you have an efficient and easy-to-use shipping software solution? If not, now is the time to implement one. Multi-channel and multi-carrier solutions like ShipStation offer an intuitive and seamless user interface to get your orders shipped out on-time. Plus, it’s really easy to train new folks or holiday temps to get shipping! Visit ShipStation.com to learn more.